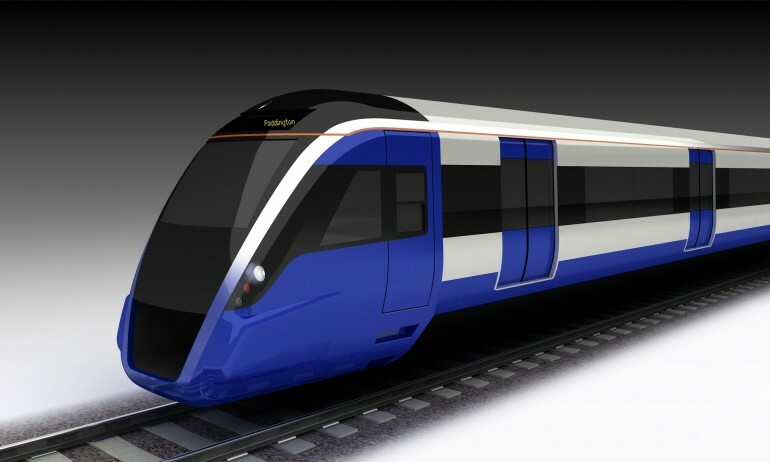 Crossrail issues rolling stock and depot tender - Crossrail . For information about the Elizabeth line please visit the Transport for London website. To deliver Crossrail services, around 60 new trains will be required. Each Crossrail train will be around 200 metres in length and able to carry up to 1,500 passengers. The tender documents set out Crossrail’s requirements for new high-capacity rolling stock and associated depot at Old Oak Common. A key feature of the new Crossrail trains is air conditioning and inter-connecting walk-through carriages. The contract will be awarded in 2014. Last summer, Crossrail announced that significant savings for the public purse, running into the tens of millions, could be realised by introducing rolling stock to the rail network over a shorter period. Crossrail will now introduce rolling stock to the Great Eastern Main Line from May 2017, with the fleet progressively introduced to the existing rail network well in advance of services commencing through Crossrail’s central section. The procurement is being managed by Crossrail. A pre-determined process will be followed and the tender documents set out the criteria that will be used to select the successful bidder. The overarching aim of the procurement is to obtain the right train at the best price. Tenders are due to be returned to Crossrail during summer 2012. Secretary of State for Transport Justine Greening said: “This is an important step in making Crossrail a reality for millions of passengers who will use it every week. Once these 60 trains are operational they will carry an additional 1.5 million people within 45 minutes of the heart of London, help the growth of the UK economy and create opportunities for new apprenticeships and jobs. The Government has been working with Crossrail to ensure that relevant recommendations from the recent Growth Review are reflected in the Crossrail rolling stock and depot procurement. The procurement process has two rounds. The focus of the first round is for bidders to provide technical proposals and their approach to securing the finance necessary to complete the project. At this point a shortlist of bidders will be invited to participate in the second round which will focus on bidders providing fully funded proposals. At the end of round two a preferred bidder will be selected to conclude the contract. At the end of each round, only bidders who meet Crossrail’s minimum technical and delivery requirements will be considered with selection based upon the most economically advantageous bids submitted. The capital cost of new Crossrail rolling stock and depot facilities is in the region of £1bn – this is the largest single contract that Crossrail will let. The intention is for the future operation of Crossrail services to be let as a concession by Transport for London (TfL) and therefore the contract for rolling stock and depot will be between the successful bidder and TfL. Crossrail will boost London’s rail-based capacity by 10 per cent, delivering new journey opportunities, faster journey times and up to 24 trains per hour between Paddington and Whitechapel during the peak. Enquiries relating to Crossrail rolling stock financing should be directed to Crossrail Sponsors – Transport for London and Department for Transport. Enquiries relating to the Government’s Growth Review should be directed to the Department for Transport. An OJEU notice for Crossrail rolling stock and depot facilities was published in November 2010. On 30 March 2011, Crossrail confirmed that the following organisations would be invited to tender for Crossrail rolling stock and depot facilities: Alstom Transport; Bombardier Transportation (UK) Limited; Construcciones y Auxiliar de Ferrocarriles SA (CAF); Hitachi Rail Europe Limited; and Siemens plc. On 15 July 2011, Alstom Transport withdrew from the Crossrail rolling stock and depot contract shortlist. Crossrail has received final approval for its detailed plans for a new rolling stock depot at Old Oak Common in west London. Planning approval has been granted by the London Borough of Hammersmith & Fulham and the Greater London Authority. Crossrail services will commence through the central tunnelled section in late 2018 followed by a phased introduction of services along the rest of the Crossrail route thereafter.